The controversy over global warming has heated up (pun intended), and people are taking another look at solar power versus generator. For those living outside the power grid, the second look may save not only the green in the rain forest, but also the green in the bank. Many who live "off the grid" in isolated locations have traditionally relied on generators for electrical power. Others have installed generators for back-up, emergency electrical power. Neither thought there was a choice, but now there is a choice: solar power versus generator. 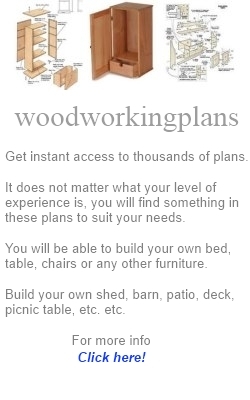 In this article, we look at the choice. Which is more economical; more convenient; more environmentally friendly? Should you make the change? The cost of solar power versus generator is much less over the long term. The initial cost of a solar power system will be greater than that of a generator system. This is often the reason people install a generator rather than choose solar power. One must look beyond the initial cost, however, to get the full comparison of solar power versus generator. Solar power, once installed, has little maintenance or further expense. There is no fuel to purchase, since the sun's energy fuels the system. Generators are not so. After installation, a generator will require regular servicing by a professional every 6 months. Generators require fuel - a cost that is constantly increasing. Moving generator parts must be replaced from time to time due to wear and tear. Convenience is another factor to consider when looking at solar power versus generator power. Solar power is much more convenient than generator power. Solar power may be less convenient to purchase and install, since it is not as widely available as generators. This is due to the currently small market for solar power. As the market increases, however, this will be less of a problem. Solar power systems have no moving parts to wear out or need lubrication. Once installed, solar power requires little attention. The user can almost forget it. Generators are widely available, so convenient to purchase and install. Convenience decreases after installation, though. A generator must be monitored frequently to be sure sufficient fuel is available. It must be refilled often when used as a regular source of power. Fuel must be ordered and delivery taken - or fuel must be hauled by the owner. The system must be serviced twice a year. This servicing will include filter changes, an oil change, a tune up, and complete inspection of the entire unit. Worn parts must be replaced. The solar power versus generator battle includes the matter of efficiency, too. Which is more cost-effective? The facts seem to point to solar power. Solar power is received in through the panels, free of cost, and stored in batteries. It is ready for use when needed, but in times of reduced usage, the power remains in storage. Generators run constantly, regardless of the amount of power being used at a given time. As they run, they consume costly fuel. When power usage is reduced in bright daylight, generators must continue to run. Some argue that, in comparing solar power versus generator, we must compare the dependability factor. In this area, they claim, generators win. Solar power is very dependable in locations that have bright sunlight 300+ days of the year. In areas with less sunlight, or during periods of cloudiness and storm, solar power is less dependable. The system will continue to provide power from charged batteries, but will eventually go dead. Having said that, it must be noted that Germany, which has far fewer sunny days than most of North America, is said to have much higher usage of solar power. The problem of dependability seems not that big. Generator systems do not depend on sunlight. They do, however, depend on fuel. If storms or some other disaster hinders one from replenishing the fuel supply, generators also become useless. Finally, eco-friendliness must be considered in any discussion of solar power versus generator. That is, which is kinder to the environment: solar power or generator? The obvious answer again is solar power. Solar power has no emissions when working. There is no pollution involved in fuel production - no greenhouse gases. It is totally clean. Solar power uses a renewable energy source. A big drawback to generator use is still the matter of emissions and the environment. Generators are usually run on diesel fuel, and diesel fuel is produced from a fossil fuel. There are emissions in the production of the fuel, and also in its use. Diesel generators are a major source of air pollution and high sulfur levels in North America. Exposure to diesel generator exhaust can lead to health hazards. For most people, the resolution of the solar power versus generator debate is to install a hybrid system. Using solar power as the main energy source will save money. The fuel is free. Solar power is convenient, efficient, and eco-friendly. What it lacks in dependability can be made up by having a small back-up generator for prolonged cloudy periods. Make your own solar panels or wind turbine. There are some other guides for DIY wind and solar generators, but all of those that I've read don't get into the same details. 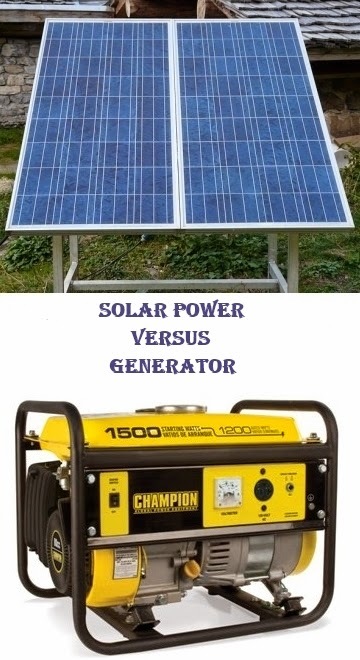 When I compare solar power versus generator, I definitely have to choose solar power. It is clean, free, quiet, and peaceful. ©2007, Anna Hart. Anna Hart invites you to read more of her articles about solar power at http://www.solar-energy-connection.com. 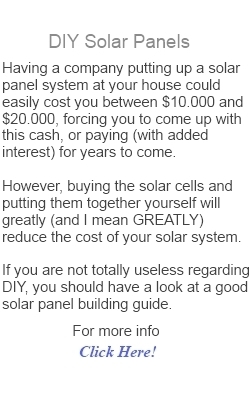 Anna has also posted articles on that site about solar power for homes. If you want basic information about solar power for the home, you won't want to miss her article on the subject. I want say that this article is very nice and very informative article.I will make sure to be reading your blog more.